Science teaching ideas, videos, and education research, from the team at Pivot Interactives. 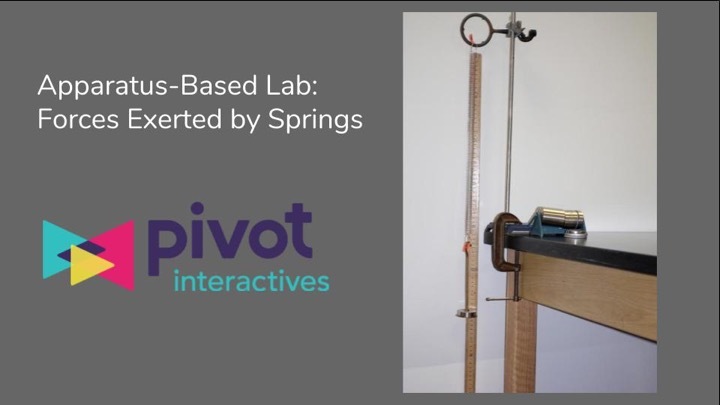 Pivot Interactives can be used as an interactive web-based lab notebook for apparatus-based activities. Teachers can create activities in Pivot Interactives that guide students through these lab activities, and allow students to create their lab report within the activity. When creating the activity, teachers can include text, equations (using LaTeX), and images, but most importantly, data tables and graphing. Students use these same tools to create their responses, and can analyze data using the integrated data table and graphing tools. Because Pivot Interactives is a web-based platform, students can access it using most web-connected devices. They can enter data during the lab activity using a laptop, tablet, or even a phone. They can complete the work later by logging back in to pick up where they left off. Teachers can provide feedback during any portion of the process. For example, teachers can check students’ lab data. This allows teachers to catch problems and offer advice long before students submit the final work. We’ve received feedback from teachers that students find the Pivot Interactives data table and graphing tool intuitive and powerful. “Better than [the previous graphing app they had used]!” exclaimed a student in Andy Fitz’s AP Physics 1 class at Adlai Stevenson High School in Lincolnshire IL. Students’ positive reaction to Pivot Interactives graphing tool is a result of our development process. We test constantly with students and teachers because we are classroom teachers ourselves. And we had the benefit of extracting the powerful features from popular graphing apps. John Burk wrote a blog post about using Pivot Interactives as an electronic lab notebook as well. These teachers inspired me to more deeply explore using Pivot Interactives as a lab notebook. Here’s a simple example. In our AP Physics C Mechanics course, we do a common lab activity where students make measurements of elongation vs applied force for a coiled steel spring. They plot this data, and analyze it to determine the relationship between force and elongation. Next, they use this model to predict the weight and mass of a mystery object. After using an electronic scale to determine the mystery object’s mass precisely, students calculate the percent difference between their prediction and the scale reading. In the past, we used a google doc or printed paper for instructions, and a graphing program like Logger Pro for the analysis. If we wanted to assess students work, or provide feedback, students printed the graph and turned it in with their written work. If a student wanted to revise their work after receiving feedback, they’d need to find the files again, make changes, reprint, and resubmit. Now, all of those steps can be completed within Pivot Interactives. It took about 20 minutes during my prep period to create the activity using the Pivot Interactives activity editor. We found that using Pivot Interactives as the electronic lab notebook reduced the time for students to complete this activity by a factor of two. In the past, we’d struggle to complete the activity in a single 48-minute class period. This year, every student was finished in 25 minutes. This was not due to pedagogical short cuts; it was because students worked in one medium rather than switching from app to app, and because the Pivot Interactives graphing tool is easy to use. While we still love using interactive video as a learning tool, a well-rounded curriculum includes lots of opportunities for students to explore with apparatus. Pivot Interactives can help students and teachers with both of these approaches.